The music of Stephen Jaffe (b. Washington, D.C.) has been regularly performed in the U.S., Europe, and Asia by such organizations as the National Symphony Orchestra, the San Francisco and New Jersey Symphonies, the Oregon Bach Festival, Spectrum Concerts Berlin, London’s Lontano, and many others. About a dozen of his works have been recorded on the Bridge, Neuma, Albany, and CRI labels, including Concerto for Violin and Orchestra (Bridge 9141) winner of the Koussevitsky International Recording Award in 2006, and also awarded 10/10 Highest Rating from Classictoday.com. Stephen Jaffe’s work has been described as direct and involving without ever being simplistic; emotionally complex but not convoluted. Writing about the composer’s Double Sonata in the New York Times, Will Crutchfield remarked that the composer’s harmonies were “rich with consonant intervals, although I would not call them neo-Romantic, and they certainly did not sound like any particular music of the past” Writers and performers alike have remarked on the composer’s unusual expressive imagination and crafted music, but also on its poetic qualities. “Like anything truly original, it is at once an exploration of new technical possibilities and a spiritual statement” wrote David Perkins of Jaffe’s First Quartet. “Jaffe’s language is comprehensive and allows him to use basic tonal or modal references, magically integrating them with a highly developed chromatic technique. The instrumental writing is brilliant and sonorous; the orchestrational textures are exquisite… My response to Jaffe’s music exceeds admiration. I simply love it,” wrote composer Yehudi Wyner. 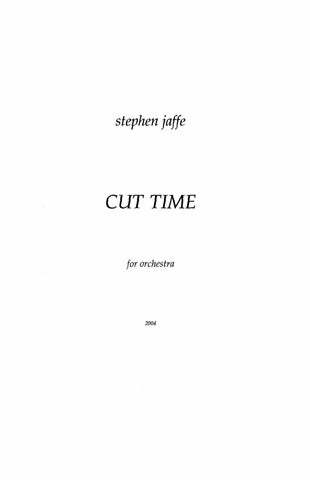 Born in Washington, D.C., Stephen Jaffe received his training in composition at the University of Pennsylvania, where he studied with George Crumb, George Rochberg, and Richard Wernick, and at the Conservatoire de Musique in Geneva, Switzerland. In addition to a Premiere Medaille from that institution, his work has been recognized with the Rome Prize from the American Academy in Rome, the American Academy of Arts and Letters Prize, and fellowships from the National Endowment for the Arts, Tanglewood, and the Guggenheim Foundation. Jaffe’s works have been commissioned by a variety of groups, including the Fromm and Naumburg Foundations, the National Symphony, and the Orchestra of St. Luke’s. Citing his “eloquent and original voice” in 1989 Brandeis University awarded him its Creative Arts Citation, and in 1991, Jaffe received the Kennedy Center Friedheim Award for his 32-minute First Quartet written for the Ciompi Quartet. In 2005, Jaffe was the Classical Recording Society’s Composer of the Year, and in 2007, a master artist at the Atlantic Center for the Arts. Jaffe’s projects have included three major concerti: Concerto for Cello and Orchestra (2003), commissioned by the National Symphony (Leonard Slatkin, Music Director), for the orchestra’s principal cellist David Hardy; Concerto for Violin and Orchestra, written for Nicholas Kitchen, recorded for Bridge by Gregory Fulkerson, violin, and the Odense, Denmark Philharmonic; and Chamber Concerto (“Singing Figures”), for Oboe and Ensemble, commissioned by the Orchestra of St. Luke’s and subsequently recorded by Speculum Musicae with Stephen Taylor, oboe. Additional orchestral premieres have included short takes such as Cut Time, also by Leonard Slatkin and the National Symphony and two orchestral works written for the North Carolina Symphony under Grant Llewellyn: Poetry of the Piedmont, and Cithara mea (Evocations): Spanish Music Notebook for Orchestra, based on Spanish Renaissance music. 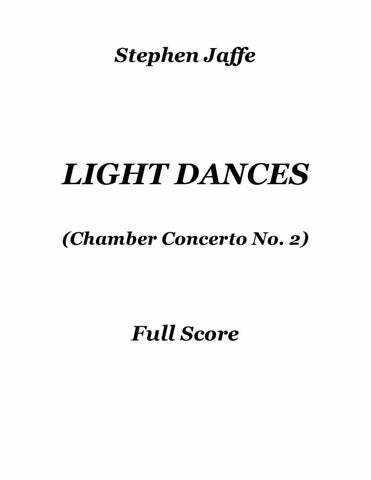 Recent contributions to chamber music include Light Dances (Chamber Concerto No. 2), written for Philadelphia’s Network for New Music; a cello and piano work, Sonata (in Four Parts) for the Kennedy Center Chamber Players, and Designs II, for a trio of clarinet/bass clarinet, guitar/electric guitar, and percussion. In the 1980s and 1990s, Jaffe composed extensively for voice, including a cantata, Songs of Turning, and three song cycles involving the poetry of Robert Francis: Four Songs With Ensemble, Fort Juniper Songs, and Pedal Point (1989-1994). Stephen Jaffe lives in Durham, North Carolina, where he teaches at Duke University and co-directs the concert series Encounters: with the Music of Our Time. In 1999 he was appointed Mary D.B.T. and James Semans Professor of Composition. Also active as a performing musician, during his career he has led many performances of his own music as pianist and conductor, as well as Night Thoughts and Appalachian Spring by Copland, On This Most Voluptuous Night by Yehudi Wyner, Ligeti’s Kammerkonzert and Stravinsky’s L’histoire du Soldat. 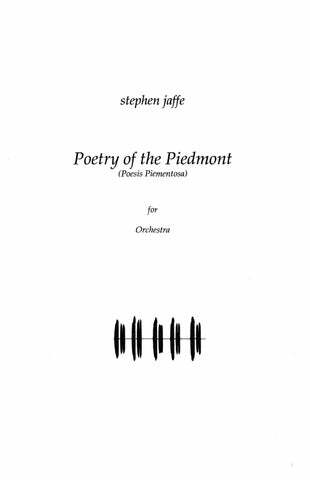 For more information, including a list of works and recordings, please visit Stephen Jaffe’s website at Duke University. Online perusal scores in the Theodore Presser Catalogue may be found here. 16:00 Fl. Cl. Vln. Vcl. Pno. 22:00 Solo Ob. ; 2Kbd.Plyrs.(Hpsd./Pno./Cel.) Vln. Vla. Vcl. 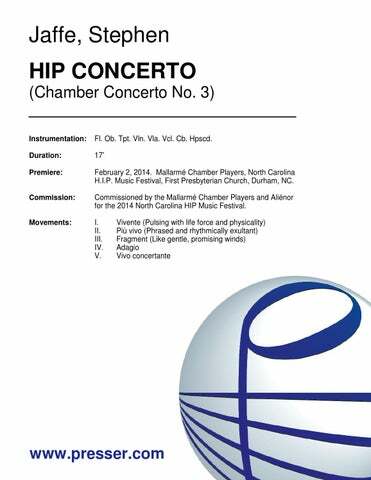 (Chamber Concerto No. 3) 17:00 Modern Instruments: Fl. Ob. Tpt. ; Hpsch. Str. Version for Chamber Ensemble 14:00 (A.Fl./Picc./Fl.) Vln. Vcl. Perc. 21:00 Mezzo-sop. Fl./A.Fl. Vla. Vcl. Pno. 4 Songs on Poems by Mary Oliver & Robert Francis 20:00 Solo Bar. ; 3Vla. Hp. Timp. 23:00 2(Picc.) 2(E.H.) 2(B.Cl.) 2 – 4 2 2 1; Timp. 2Perc. Pno.(Cel.) Hp. Str. for Orchestra 15:00 3(dbl. Picc.) 3(E.H.) 2 2 – 4 3 3(opt. Alto Tbn.) 1; 3Perc. (1st is Timp.) Pno.(Cel.) Hp. Str. 35:00 Solo Vln. ; 3(Picc.) 2(E.H.) 2(B.Cl.) 2 – 4 3 3(B.Tbn.) 0; 3Perc. Pno.(Cel.) Hp. Str. 28:00 Solo Vcl. ; 4(dbl. 1Picc., Alto Fl.) 2 3(dbl.E-Fl.Cl., B.Cl.) 3(dbl.Cbsn.) – 4 2(opt.Picc.Tpt.) 3 1; Timp. 3Perc. Pno.(Cel.) Hp. Mandolin. Str. 2:00 3(dbl. Picc.) 3 3(B.Cl.) 3(Cbsn.) – 4 2 3 0; Timp. 3Perc. Pno. Str. for Orchestra 21:00 3(Picc. and Alto) 3(E.H.) 3(B.Cl.) 3(Cbsn.) – 4 3(Picc.) 2 1; 4Perc. Pno.(Cel.) 2Hp. Str. …often intense…[an] overall attractive work in which there is some refreshing and decidedly unanticipated utilization of the instruments. …an equally attractive piece. 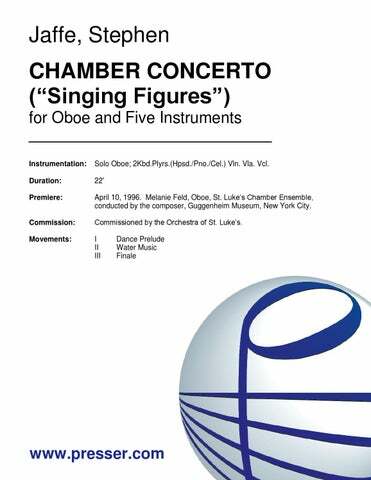 The solo part is written for oboe, and is superlatively performed by Stephen Taylor. The interplay between harpsichordist Stephen Beck and pianist Stephen Gosling is of particular interest. …an intriguing study in how many different varieties of tone color you can get from six instruments…The writing for the oboe varies from solemn, lyrical and poignant to impudent and brash. The work is well designed, original, contemporary in harmony and rhythms, and unusual in tone colors… The performance was exciting and the audience’s applause resulted in an encore. …a good natured and essentially lyrical work for oboe, strings, piano, harpsichord, and celesta. An enlivening feature of the scoring is Mr. Jaffe’s use of the harpsichord, which sounds slightly incongruous in this setting, not least when it mirrors some of the more aggressive figures in the oboe line. Stephen Taylor…gave a beautifully polished performance of the prominent oboe part. 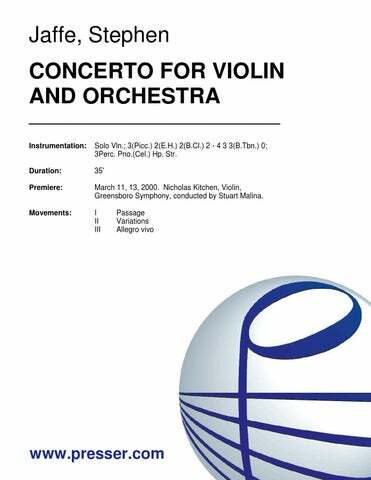 The most impressive work on this disc is the large-scale, 32-minute “Concerto for Cello and Orchestra.” In four movements, brilliantly performed by David Hardy, principal cello of the National Symphony, with the Odense Symphony Orchestra conducted by Paul Mann, this concerto exploits all the technical and expressive resources of the cello. The orchestration is particularly imaginative, featuring soloist set against shifting groups of instruments including mandolin and steel drums. Jaffe’s brilliant orchestration and accessible tonal language make this work a notable addition to the repertoire. The performances are excellent and recording quality of this CD is first rate. I recommend this disc to anyone interested in 21st century American Music. …a virtuoso piece with genuine intellectual aspirations, combining rapt lyricism with a sense of sonic adventure…expertly made, original in form and utterance. 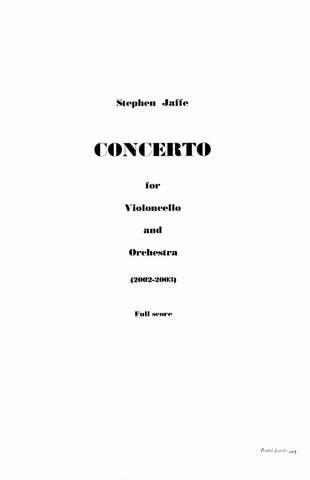 Stephen Jaffe’s “Concerto for Violoncello and Orchestra”…packs all sorts of ideas and instrumental effect into 30 minutes. The style is complex, unpredictable and riveting. …An impressive piece, demonstrating the composer’s masterful handling of orchestral color and instrumental deployment. His music has a way of reconciling opposites: dense and light, serious and witty, complex and transparent, terse and expansive, playful and challenging to perform. Remarkable is the way the violin seems to always recover its equilibrium after sudden onslaughts from the brass and percussion, especially in the opening movement, singing, leaping, or soaring with a spontaneous lyrical impulse. …full of variety and very appealing. … big, colorful, and exciting – the work of a master orchestrator and a master composer … the distinguishing characteristics are the rich variety of the scoring, the eloquent woodwind, brass and percussion parts, the clear definition of the strings, and the ingenious way the solo passages have been integrated into the fabric of the music. … This is a happy, often joyous score, one that should certainly enjoy a fine life of its own. Those who attended its birth in Greensboro ought to take pride in having been present at an important launching. …his concerto sets modern musical accents against some passages which would not have been out of place in the Romantic era..Jaffe..is rehashing nothing. His music speaks in a voice clearly of the present, yet juxtaposed against earlier musical traditions. …Highly imaginative…calling for some very exotic percussion, including steel drums, the exquisite violin part floats over an intricately colored, late romantic sounding, orchestral landscape. 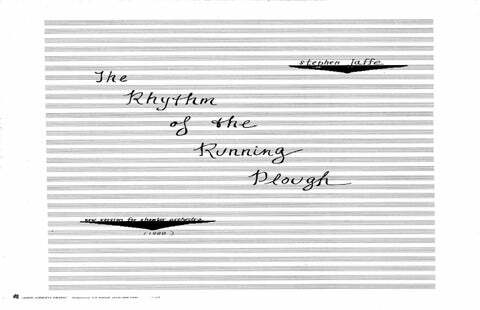 …a work really imagined for what two pianos and two pianists can do … the whole piece is chock full of ideas and uncommonly assured in activating those ideas … the performance was a knockout. …a large ambitious work in four movements, full of bristling energy: jaunty, faintly jazzy rhythms, myriad virtuosic challenges for the players, and a bracing, hyperactive kaleidoscopic jangle. …its slow movement is a tribute to the composers Morton Feldman and Vincent Persichetti, and yoked together something of Feldman’s ruminative style and Persichetti’s trenchant harmonizations. The outer movements were brisk, rich in detail, and cast in a prickly, compelling chromaticism. This work of irreproachable workmanship utilizes a grand profusion of thematic ideas. The indications ‘Bold’, ‘Sportive’, ’Breathing’, or ‘Rapid’ give care to affirm the unusual clarity of a work to get to know. Jaffe’s “First Quartet” was the crowd-pleaser. Its romantic lyricism, its organization, its long solos for each instrument and its lush textures made it seem like a work from the early years of this century, but heard with fresh ears. There is something truly original about the work of Stephen Jaffe. Emphasis on the word truly. …Without a score or a chance at a second hearing, an intelligent analysis is impossible. But it was never dull, never easy, never repetitive, and it left me wanting to hear it again. Like anything truly original, it is at once an exploration of new technical possibilities and a spiritual statement. …demands much, but gives back in like measure. It is a curious, clever, yet moving landscape of sound. The most powerful and strongest feeling is derived from listening to a cycle of seven works set to words from Robert Francis. 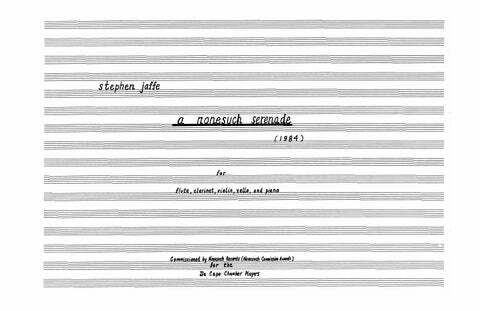 “Fort Juniper Songs” by Stephen Jaffe…combine intellectualism with emotionalism, irony with dramaticism, and very careful treatment of poetry with modern musical language… “Fort Juniper Songs” is quite an autonomic composition, with very original concepts, free from eclectic elements quite often seen in American music. …skillful settings of the alternatively playful and poignantly metaphoric poetry of Robert Francis. …the divided orchestra proposes a distinctive sonorous atmosphere as the basis for the growth of each of the four pieces. … a stunning contemporary work, colorfully orchestrated, intense and interesting. Stretching across a 16-minute span, the single-movement work covers a lot of territory, ranging from a slow, quiet introduction with haunting rhythmic figures in the viola to a series of emotionally wrenching climaxes of great power that involve all three players. All this is woven around a prominent harp part demanding exceptional dexterity that seems to be the musical and spiritual core of the piece… warmly received. …delightful fantasy… the novelty of the music inspired the players … it has a natural and dramatic progression, sustaining meditative passages without lapsing into the realms of the dull and static. 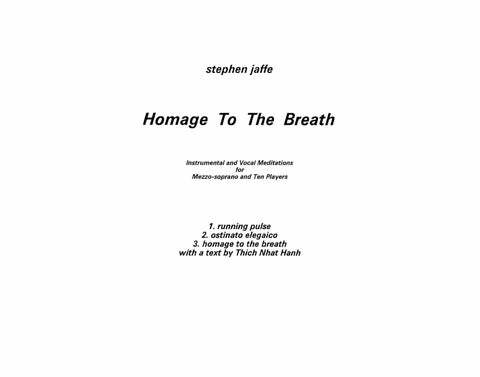 …Stephen Jaffe’s works can thunder but also dazzle with their precise attention to poetic texts being beautifully sung. …Jaffe said his intent was “crossing sacred and secular boundaries.” His use of text from such sources as Ann Landers, Denise Levertov, and the Book of Jeremiah underscored this ecumenical flavor … His setting of Mary Oliver’s ‘The Buddha’s Last Instruction’ is a jewel all by itself, and the closing ‘Transformations’ with its exquisite choral segment of poetry by Denise Levertov, truly lifted the heart. It is a wonderful, flowing piece, lyrical and intense. …a gentle work of warm expressiveness. The writing is free, eminently musical and unselfconscious. …truly original writing that never over-stepped conventional bounds, yet never sounded conventional, either. …the second movement captured the various colors of light, not just with the special instrumental effects, but also with Hexagon’s ability with color. Six instruments combined to produce what seemed like six hundred textures with various timbres and effects. Performer(s): Terry Rhodes, soprano, Ellen Williams, mezzo-soprano, Stephen Jaffe, piano.